Katmai National Park offers extraordinary viewing opportunities of the coastal brown bears which congregate to feed on the abundant spawning salmon. Other activities include hiking and kayaking, backpacking and camping. Other sites include the Valley of Ten Thousand Smokes and numerous scenic viewpoints in the surrounding hills. next » | 626 sample images from this category. Try a keyword search to see them all. Brown bear portrait, Katmai National Park, southwest, Alaska. 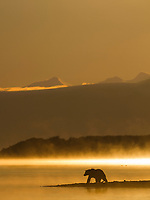 Brown bear wades in Naknek lake, Katmai National Park, southwest, Alaska. Spring bear cub stands alert in Katmai National Park, Alaska. Fly fishing in the Brooks River, Katmai National Park, Alaska. Brown bear, Katmai National Park, southwest, Alaska. Brown bear in the forest, Katmai National Park, southwest, Alaska. Brown bear along a trail, Katmai National Park, southwest, Alaska. Brown bear walks along a path, Katmai National Park, southwest, Alaska. Brown bear cub, Katmai National Park, southwest, Alaska. Brown bear claws, Katmai National Park, southwest, Alaska. Brown bears, Brooks River, Katmai National Park, southwest, Alaska. Brown bear swims across Brooks River in the morning fog. Red salmon "sockeye" leap up the falls of Brooks River. Gray wolf along the shore of Brooks River, Katmai National Park, Alaska. Brown bear sow nurses cub, Katmai National park, southwest, Alaska. Brown bear boar, Katmai National park, southwest, Alaska. Brown bear sow and cubs, Katmai National park, southwest, Alaska.